Upper back pain is much rare compared to lower back pain and is often related to larger muscles rather than discs. 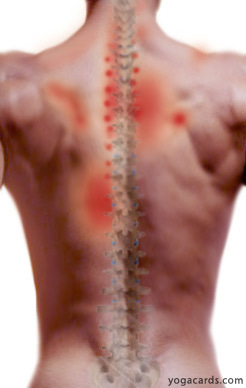 Due to limited motion in the upper back it does not tend to develop disc herniations (bulging discs) or instability. Upper back pain is often caused by large muscles in the shoulder area. Yoga exercises are done in ways that cause good stretching and strengthening the muscles. 1. Poor posture often causes pain in the upper back. See Proper back posture. 2. Whiplash can cause muscle and ligament problems in the upper back. 3. Muscle imbalance – Using one side of the body more than the other can cause all kinds of muscle imbalance. 4. Muscle damage – Any kind of strain or tear which is a common occurrence. 5. Ruptured or damaged spinal discs can sometimes be the problem. 6. Facet Joint pain usually occurs in the shoulder area, neck and upper back. Often times the ribs connecting vertebrae in the thoracic spine with joints on each side of the spine get aggravated or misplaced due to imbalance in ligaments and muscles. This results in upper back pain Facets are paired joints on each vertebrae. The facet joint has articular cartilage which does not heal well when damaged. Pain on one side of the upper back. Facet Joint pain usually occurs in the shoulder area, neck and upper back. Use these cards as stretches to help alleviate the pain when it comes on. Facet Joints can sometimes be clicked back in with manipulative techniques. A Triangle shaped muscle that covers the rhomboids and even part of the Latissimus dorsi. Pulling the shoulder blades inward towards the midline), moving the scapula up and down. 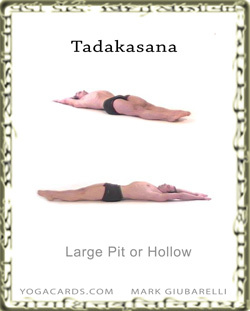 Po stures like Cobra pose done mildly often helps relieve upper back pain. Cobra pose is a healing yoga posture for many back problems. These postures can help reduce and even heal upper back pain when done regularly. Above you can see these lying spinal twists we recommend for all kinds of back pain. Here are the modifications for upper back pain reduction and to encourage balanced shoulder muscles. When in the spinal twists hold for at least a minute so that the muscles relax and the shoulder opens. Begin rotations of the arm you look down. The direction of these rotations should be down towards the hip first then round and up. Each time rotate the arm stretching outward always extending with a good stretch. Feel like you are drawing large circles with your hands and arms. Always move the arm at a safe slow speed. People almost always rotate there arm too fast especially during crucial parts of the rotation. Switch from one side to the other every so often so that you don’t feel uncomfortable. The largest of the upper back muscles. Adduction (pulling the arm towards the body), internal rotation because and extension of the shoulder joint (anatomically known as the glenohumeral joint). It’s also very important in stabilizing the spine in forward bends and backbends. Here are the Upper Back Pain modifications for the exercises below. A healthy spine can be achieved with regular back exercises and many times back pain disappears. Proper posture must also be practiced to greatly reduce back pain on daily basis. Here is a simple exercise for Upper Back Pain. Come on to your hands and knees. Stretch your shoulders up and tuck your chin in. Then inhale and tilt the chest down looking forward. Hold for a few breaths then tilt back up as you exhale. Do this 8 to 12 times to loosen tight neck muscles and correct poor posture. (Major and Minor) These muscles pull the shoulder blades (scapulas) together. Downwardly rotates the scapula. Many yoga poses help relieve back pain. Try some of these. Yoga for Scoliosis – Scoliosis is a very complicated back problem. 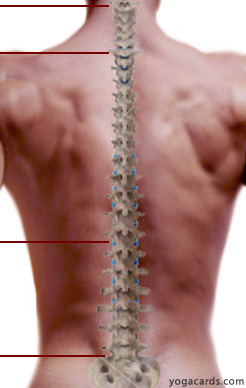 Unlike many other back problems which are usually in one area scoliosis is an imbalance of the entire spine. What are bulging discs and can I heal them.